The British Columbia cedar and pine make up the outside of the villa; it gives it a sober character and great quality! Only a few houses for rent in Canada have used a designer of international level. A big difference! With 7000 square feet of living space, Villa Marvic offers a multitude of places where you can take time for yourself and relax as well. All in a breathtaking panorama. The dining area, kitchen and main living area on the ground garden can accommodate up to 50 people. Ideal for a family celebration, a lake to the shoulder or a reception with friends. Located in the municipality of Petite-Riviere-Saint-Francois on the St. Lawrence River in the Domaine du Massif, Villa Marvic is the ultimate luxury accommodation in the mountains. Rated 5 stars by the Office du tourisme du Quebec, our prestigious residence will amaze you with its unique architecture, as well as its contemporary European style interior design. La Villa, a luxury chalet, offers 7000 sq. ft. of living space. 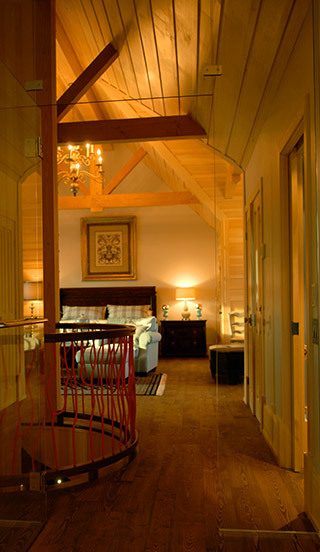 The executive suite loft alone occupies approximately 1000 sq. ft., including a dining area, a fireplace and a large flat screen. Five more spacious, beautifully decorated and fenestrated rooms occupy the first floor, while the TV room, billiards room, steam bath are on the ground in the garden. Outside you will find a sauna, a whirlpool bathtub, a 42ft exercise pool several terraces. All located on a large wooded lot within walking distance of a waterfall. Standing in the dining room you will see, in the east, the Isle-aux-Coudres. Straight ahead we offer Battures aux Loups Marins and west, the Massif. 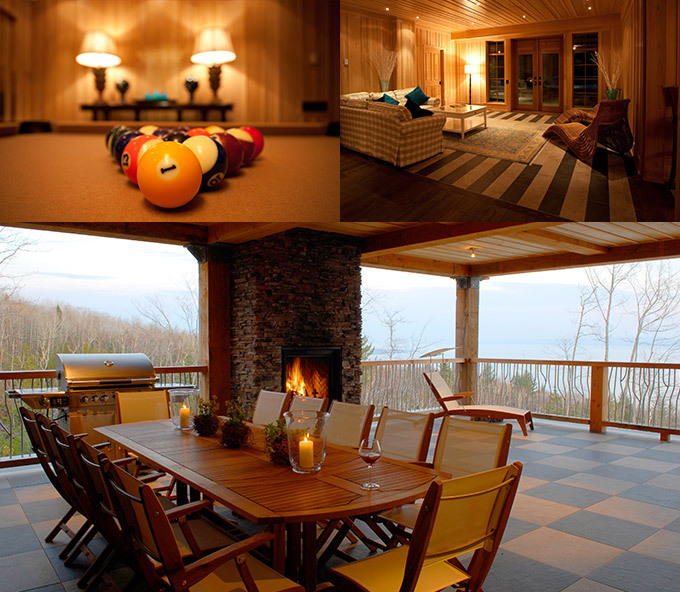 Imagine yourself lounging on one of our terraces or just warm up In front of a wood fire. Villa Marvic, a luxurious and prestigious resort for memorable stays.